I was adopted on February 2/19! Lovely gal Lacey arrived in our care on November 17th and has settled into her foster home very well. Lacey knows a few commands and her foster family are working on teaching her more of the basics. She is a bright girl who is eager to please and she is picking up new commands quickly. Lacey is very much like a puppy still! Her house manners are ok, except for attempted counter cruising! Her leash manners could use some spiffing up as well, her foster family are working on this and making great strides. Adopters who are willing to put in some work around obedience training will be best for her. She is an active girl who has fairly high energy and will be well suited to owners who are interested in getting out and being active with her, working her mind and body to meet her enthusiasm! She's a spunky gal! She is said to gets along well with other large dogs, happily living with another Newf before coming to our program, and is doing well with her foster brother. 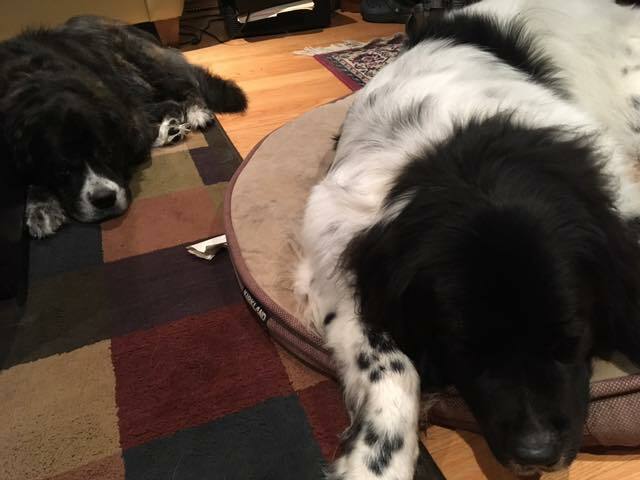 A very well socialized large or giant breed dog who plays nicely would be a good fit as a playmate for Lacey. Having said that, Lacey does have prey drive issues and is not reliable around small breed dogs or cats in her home. Her surrendering family reported that she is fine walking by small breed dogs while out on leash though. (Further assessment pending.) After Lacey's owner passed away earlier this year, Lacey moved in with her owner's daughter. Despite several months of work, Lacey could not be left with the resident small breed dog reliably. Due to Lacey's prey drive homes with cats or small-breed dogs will not be considered. She is also not a candidate for dog parks. Lacey would be happiest in a home where she will not be left for long hours every day. A few hours a day would be fine, but she is very people focused and will not be happy being left long days alone. Further details about Lacey will be posted as we get to know her.